We all know that Google promised Android One devices that they will get Android Lollipop or any other Android's latest release. Today Micromax just announced that over the course of a week it will be rolling out the Android 5.1 Lollipop update to its budget-minded Canvas A1 smartphone. The update is being seeded in India, and comes just in time not to break Google's promise from a few weeks ago. The update shouldn't surprise anyone as Android One smartphones have since been launched with the latest Android version out of the box in multiple countries. Meanwhile, devices in India have remained on the still prevalent KitKat iteration. 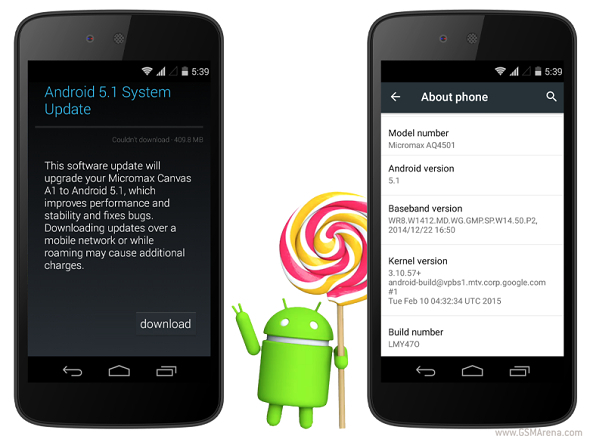 The Android 5.1 update brings improvements and bug fixes over the the 5.0 installment in several areas. Most notable to the end user is the return of silent mode, as well as better quick settings implementation for Wi-Fi and Bluetooth. Native multiple SIM support is brought along and a new security feature locks the phone until you sign in with your Google account, as an added deterrent to phone theft.